Hot peppers, also called chilis, come in a variety of colors and types with varying levels of heat. The Scoville heat scale, created by Wilbur Scoville, is used to rate the heat in a pepper. This heat is caused by capsaicin, a compound found in the ribs of a pepper. You can reduce the heat of any pepper in part by removing the ribs and seeds. Capsaicin does not have any flavor, so it does not affect taste buds. Instead, the pain receptors in the mouth react to the capsaicin in a hot pepper. Hot cherry peppers are round peppers that change from green to red as they mature. They are mild with a heat level of 500 and have something of a sweet taste. Banana peppers are another mild-heat hot pepper. These peppers are 1 to 2 inches long, yellow to orange in color, and their curved shapes resemble bananas. Banana peppers often are used on sandwiches. Sometimes they are mistaken for yellow wax peppers, but they are lower in heat units on the Scoville scale than the yellow wax peppers. 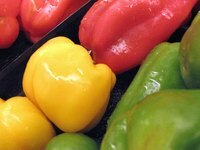 A cascabell pepper is found only in Mexico. It has a medium-to-hot Scoville scale rating. This type of pepper is usually dried and looks like a hot cherry pepper, except that the skin is thin enough so you can see through it. Fresno peppers start green, turn orange and then become a brilliant red at the end. They are cone-shaped and resemble a jalapeno pepper, except that they are smaller. Summer Fresno peppers are not as hot as those that mature in autumn. The mirasol pepper is thin and can be large or small. It is red and can be smooth or wrinkled. It has a fruity flavor. The habanero pepper is one of the hottest peppers in grocery stores. If they are green, they have not ripened fully. Once ripened, they are orange or red. They also occasionally come in brown or white. The cayenne pepper is strong, red and used in many recipes as a spice. While it's not the hottest pepper, it can deliver quite a kick in cooking. The Scotch bonnet chili pepper has a heat unit index of 325,000. It looks like the habanero, except it is smaller. Another popular hot pepper, the chili de arbol, also called the arbol pepper, is very hot. Related to the cayenne pepper, it is used for holiday wreaths in addition to seasoning food. It is best to use gloves when handling the flaming-hot peppers, and avoid getting the oils in your eyes. A few peppers have varying ranges of low-heat to high-heat units on the Scoville scale, depending on how they are grown and prepared. The most widely known of these is the jalapeno pepper. These are green or red depending on the season and ripening stage. Fresh jalapeno peppers are hotter than canned or jarred ones. Chipotle peppers usually are smoked jalapenos, but can be other kinds of peppers. The heat of a chipotle can vary because of this. If the chipotle is a jalapeno pepper, it is slightly hotter than the jalapeno in its original form.